Alumnus Rakesh Nagi (ME Ph.D. 1991) has been named the Donald Biggar Willett Professor and Head of the Department of Industrial & Enterprise Systems Engineering at the University of Illinois at Urbana-Champaign (UIUC). This summer, Nagi joined UIUC from the University at Buffalo (State University of New York), where he had been on the faculty since 1993. He served as the chair of the Department of Industrial and Systems Engineering there from 2006 to 2012. Nagi also was a research associate at France’s National Institute for Research in Computer Science and Control (INRIA). 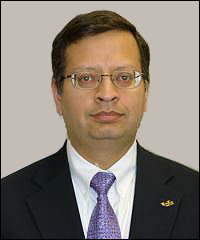 Nagi is an expert in using location theory to improve production systems, information-based manufacturing, and military application of operations research. He is a Fellow of the Institute of Industrial Engineers. "Rakesh is an accomplished researcher, teacher, and administrator," said Andreas Cangellaris, dean of Illinois' College of Engineering. "His research in and perspective on the fusion of sensor-based data and human information sources will be a welcome addition to our rapidly growing Big Data efforts." At Maryland, Nagi was advised by the late Professor George Harhalakis (ME/ISR). He won the ISR Outstanding Systems Engineering Graduate Student Award in 1991. Alum Jason Li promoted to VP of Research and Development at Intelligent Automation, Inc.